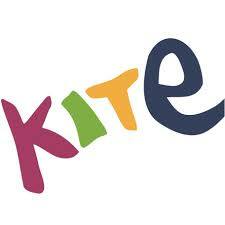 Kite Clothing is a brand of organic clothing for children aged 0 to 12 years. Each piece created by this company is rich in detail, designed to ensure the highest quality and decreasing the maximum environmental impact. The design brings inspiration to the landscapes of the county of Dorset in which is located the headquarters of the company, which gives the garments a look inspired by nature. 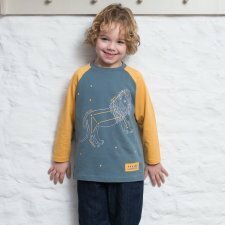 The garments are made from organic cotton paying maximum attention to manufacturing and ensuring fit, comfort and durability. Longsleeves shirt in organic cotton with Leo costellation. 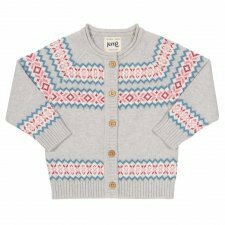 We are quite a lot in love with this Fair Isle design cardigan in classic grey marl with lovely winter inspired contrast colours. 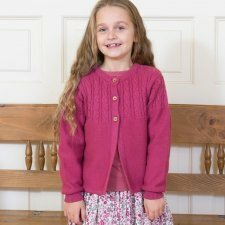 Super stylish yet perfectly practical, this wonderful layer looks simply gorgeous. For any vehicle mad boys (or parents!) 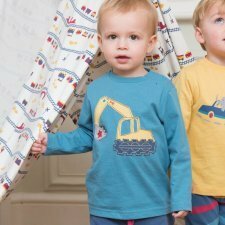 we've got a fabulous excavator appliqué which looks super cool on this long sleeved t-shirt. With popper shoulder opening. 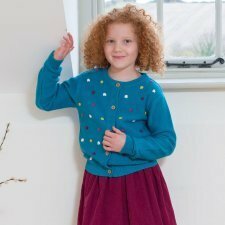 Our sea green love heart cardi is just the thing for the little one you love. 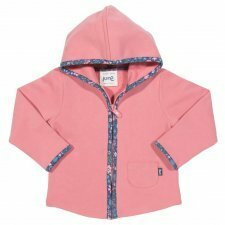 So cute and a super practical layer that looks simply gorgeous, especially over our delightful rambling rose dress. This classic zip through hoody will go down a treat as a useful little layer. 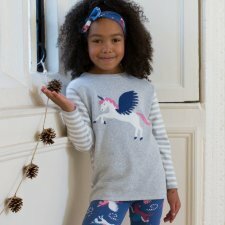 With our delightful acorn ditsy print trim this super soft piece is sure to be worn all the time. 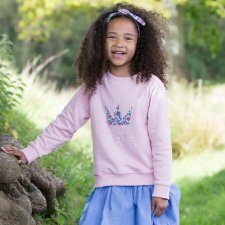 A gorgeous piece of knitwear that is adorned with little 'baubles' on the front panels to give a rather special and seasonal look. Coconut button opening. Looks perfect layered with all of our winter outfits. These have got to be the comfiest jeans ever. 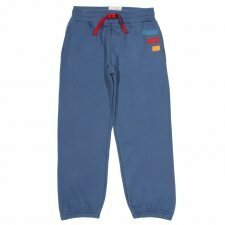 With a soft rib elasticated waistband and reinforced patches at the knees they really are the business. Adjustable waist. Slim fit. 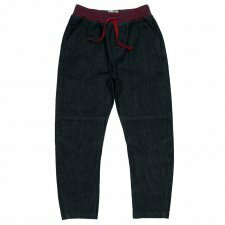 To give these jeans a soft and lived in look they have been washed in natural enzymes that come from apples. 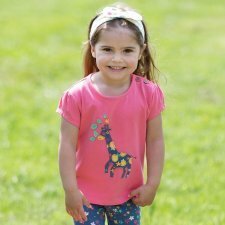 A great little tunic and leggings outfit, perfect for play days, holidays and more. The plain blush leggings team effortlessly with our lovely Pegasus A-line top. 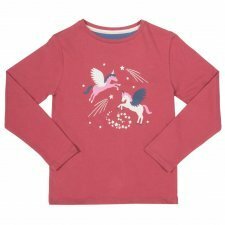 A perfect piece of knitwear for the season, adorned with a Pegasus intarsia. Little details like the stripy grey marl and cream sleeves and longer tunic silhouette really set this jumper apart. Works wonderfully over our Pegasus leggings and is sure to be adored by all those unicron lovers out there. 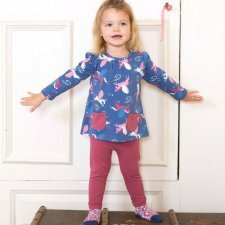 A stunning little springtime dress featuring our raspberry petal print. Made with our soft stretch jersey it has three quarter elasticated cuff sleeves. A versatile dress that can be worn for so many different occasions. 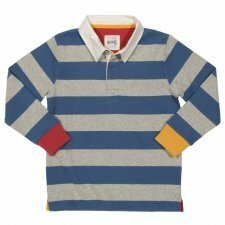 A simple stripe, but oh so effective in this great long sleeved rugby shirt made from our yarn dyed striped peached jersey. In honour of the team's playmaker the back features a number ten appliqué. This gorgeous kitty inspired sweatshirt featuring the queen of all the cats just makes us smile. 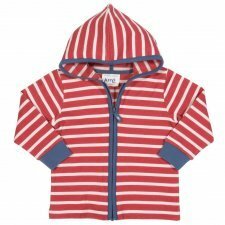 Made from our lovely brushed back sweat fabric it's a super cosy piece that is sure to be worn again and again. 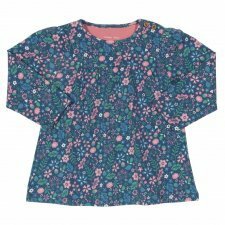 A great little tunic and leggings outfit, perfect for play days, holidays and more. The plain Sea green leggings team effortlessly with our delightful heavy jersey rambling rose A-line top. We've got just the right fabric, fit and look for the most comfortable joggers. With so many features they really are quite special. Everyone needs an apron and our special little version creates the perfect gift! 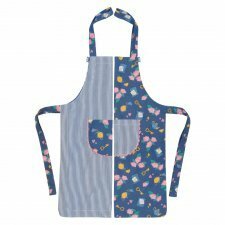 This reversible apron made from our wonderland print on one side and blue ticking stripe on the other has contrast ric-rac trimmed pockets on both sides and can be worn whichever way you fancy.